Training Camp Question #5: Is Tremaine Edmunds Ready to Lead the Defense? For the next 6 days, leading up to the start of Bills Training Camp, Buffalo Sports Page will ask and answer the ten biggest questions facing the team in 2018. One of the big questions for me coming into training camp is…can Tremaine Edmunds lead the Bills defense? The reason I ask is because when Edmunds was drafted he was only 19 years old. He has since had a birthday but to ask a 20 year old to come in and lead the defense is a lot to ask of anyone. Edmunds of course is not just anyone. His father Ferrell Edmunds played in the NFL and appeared in two Pro Bowls. His brother Terrell was drafted by the Pittsburgh Steelers at the end of round one this year and he and Tremaine became the first brother duo drafted in the first round of the same NFL draft. Older brother Trey already plays for the New Orleans Saints. So this is not your normal family. Edmunds improved each year at Virginia Tech. Last year was his best. He recorded 108 tackles and had 5.5 sacks. He was a finalist for the Butkus award going to the top linebacker in college football. He was one of the top two linebackers coming out in this year’s draft. There’s no doubt Edmunds bring elite traits to the table. Scouts raved about his instincts as a player. As a linebacker that the Bills hope will lead their defense having great instincts is a must. Athletically he is so much better than Preston Brown. He’s 6’4 and his wingspan is incredible. He was versatile at Virginia Tech and showed he could play inside or outside. He can go sideline to sideline to make tackles. He showed he could rush the passer. He could cover and stop the run. He was projected to go in the Top 10 of the draft. The Bills moved up to 16 and feel they got a steal. 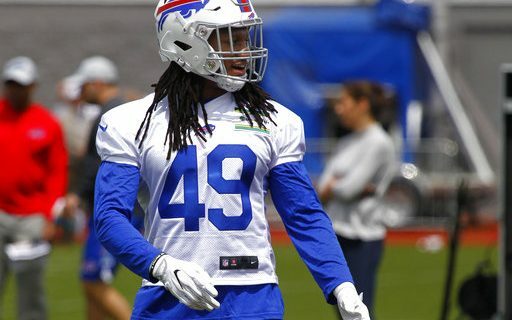 During OTA’s, Edmunds got rave reviews for his command of the huddle. Tre’Davious White called him an “alpha male.” Davis went on to say that his knowledge of the game is next to none. Other Bills commented that they have the same feeling about Edmunds as they did Tre-Davious White last year. This is in terms of coming in and seeing this guy is a player from day one. Still, all of the accolades aside, in my eyes it’s still hard to come in day one and ask a young man to become the signal caller and leader of your defense. He will need help from the Micah Hyde’s on the team. He needs to focus on being in position himself. That’s usually a ton to ask from any rookie. Put yourself in the proper position. If Edmunds did that it would be huge. To ask him to not only put himself in proper position but to put others as well seems like a huge question that needs to be answered in training camp. #1: Will The Bills Get A Pass Rush? #3: Will The Bills Defense Be Elite? #4: Will Brian Daboll Change the Offense?